Dermagen Formulated Skin Care / Gee Whiskers! I did a post a while back on the Trichotin Hair Regenesis supplements (read it here). Following my two month Trichotin course I was advised to start my Dermagen Formulated Skin Care supplement course in order to get the best results. This is because my body's vitamin stores needed to be built up first. Dermagen, as with Trichotin, is a beauty supplemet that is scientifically formulated to stimulate the body's circulatory. It also nourishes and revitalises your skin. 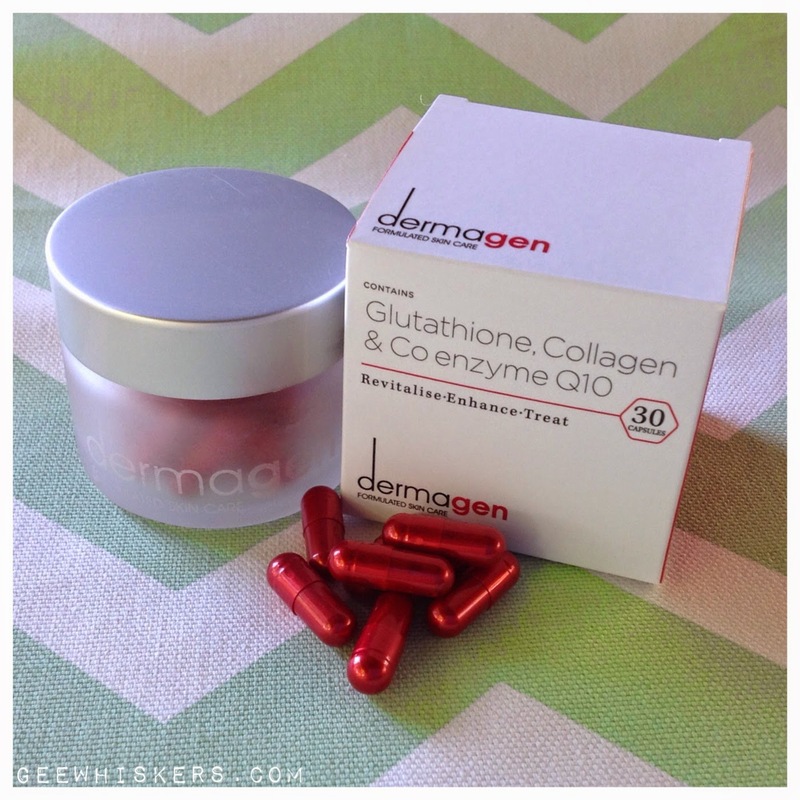 Dermagen contains Glutathione, Collagen and Co Enzyme Q10. The capsules also contain essential vitamins, minerals and antioxidants. All these ingredients work together to detoxify the skin, treat skin disorders, enhance skin clarity, improve skin tone and elasticity and reduce visible signs of ageing. You can view all the ingredients and their benefits on the Dermagen website (click here). I was advised to follow my 2 month Trichotin course with the Dermagen. Trichotin helps prepare the body by building up the vitamin stores in one's system. Since taking Dermagen I noticed that my skin still showed all the benefits I saw from Trichotin but the biggest improvement I noticed was in the complexion of my skin. It definitely looked far more radiant and even than before. I also found that my skin was far less reactive to stress. When I get stressed I get a slight rash across my skin and while taking this I definitely experienced less of this. At the moment my stress levels are quite higher than usual with my conference presentation being less than two weeks away. Unlike beauty creams, these beauty supplements work from within and you'll notice visible signs of improvement to your entire body. The skin all over my body feels softer, smoother and looks visibly a lot more radiant. That is a tall order when it comes to me me because my skin is dehydrated all over my body and I purposefully stay out of the sun to avoid sun damage to my skin (which means I have pale skin). As with Trichotin, the packaging is luxurious. I have to admit, taking any other supplements or medication feels really ordinary when compared to opening up a frosted glass jar. I also really love the shiny, bright red colour of the capsules. It really is great when you take these types of supplements and see the great results, it truly does take the chore out of taking them everyday. Thank you once again to the Trichotin and Dermagen team for sending me these fantastic supplements to try out. For those of you who are interested in trying Dermagen for yourself you can buy a one month supply for R395 from the online store. For a full list of stockists visit the Dermagen website.